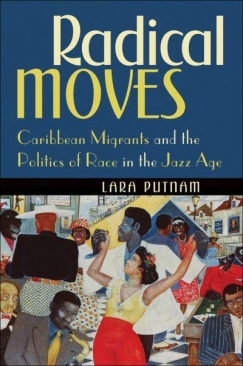 John Cline reviews Laura Putnam’s Radical Moves: Caribbean Migrants and the Politics of Race in the Jazz Age for The Los Angeles Times. IN 1987, THE EMINENT ETHNOMUSICOLOGIST Richard K. Spottswood compiled an LP for Arhoolie Records titled Where Was Butler? It was subtitled “A Calypso Documentary from Trinidad,” and features many of the stars of the island’s music scene from the 1930s, including Attila the Hun and Growling Tiger. While this record has never been re-released on CD, nor is it available on iTunes, its 16 tracks constitute one of the most fascinating calypso collections ever produced. Long before Public Enemy’s Chuck D proclaimed his oft-repeated maxim that hip-hop is the “black CNN,” calypsonians from Trinidad were narrating the struggles experienced by the island’s oil field workers, led by one Tubal Uriah “Buzz” Butler. In addition to being a labor leader, the Grenada-born Butler was also a Spiritual Baptist preacher, a faith practice then outlawed in Trinidad due to anxieties provoked by its Pentecostal-like emphasis on shouting and physical “possession” by the Holy Spirit. black-internationalist and anti-colonial movements that would shake the twentieth century were rooted in the experiences of ordinary men and women — not only the cosmopolitan streets of Harlem and Paris but also in the banana ports and dance halls of the tropical circum-Caribbean. Radical Moves thus implicitly offers a corrective to conventional histories of African Diaspora. Paul Gilroy’s 1993 The Black Atlantic: Modernity and Double Consciousness stressed the international character of the literature and politics of African-descended peoples in the 20th century, and focused his attention on major figures like W.E.B. Du Bois and Richard Wright. In the ensuing years, scholars like Brent Hayes Edwards and Minkah Makalani have expanded on Gilroy’s “Black Atlantic,” focusing on metropolitan centers like New York, Paris, and London, filling in the details with somewhat lesser known individuals and organizations. These authors, like Gilroy, prefer to write about individuals with international profiles and concrete political movements, from Claude McKay to the African Blood Brotherhood in Harlem and from George Padmore to the International African Service Bureau in London. In Radical Moves, however, Putnam chooses to focus instead on “the forgotten editors of port-town newspapers and the many thousands of men and women who read their pages and debated the merits in rum shops and butcher store queues.” Within the historiography of the African Diaspora, this is a shift akin to that between the union-centric studies of the “Wisconsin School” of labor history and the opening up to the quotidian of E.P. Thompson’s The Making of the English Working Class. Putnam’s first book, The Company They Kept: Migrants and the Politics of Gender in Caribbean Costa Rica, 1870-1960 was a much more localized telling of the story that she expands to both the Lesser and Greater Antilles in Radical Moves, as well as to the mainland areas that border the sea in Central and South America — the zone she calls the “circum-Caribbean.” The Company They Kept focuses on Port Lim&oacute;n, which plays an important role in Radical Moves: as the entry point for the coastal, banana-growing region developed by The United Fruit Company, the city attracted migrants from across the British West Indies, particularly Jamaica. Radical Moves’ great achievement lies in connecting local histories of migrants across the circum-Caribbean, and tying these regional conditions to global issues of race, citizenship, culture, and empire. In this, Putnam’s book bears comparison to Penny von Eschen’s Satchmo Blows Up the World, which retold the story of American jazz musician “ambassadors” on State Department-sponsored tours of the Third World during the Cold War; in fact, von Eschen blurbs the back of Radical Moves. But Putnam’s book is all the more impressive because, unlike Satchmo, there’s no singular bureaucratic thread around which to build the story. Radical Moves both de-centers the conventional narrative of the African Diaspora and culls its material from a diffuse, fragmentary historical record. Radical Moves eschews theory. Putnam builds her arguments from primary sources, and renders conclusions in clear language. In the few instances where recourse to theory becomes necessary, she limits her framework to two essential concepts: Benedict Anderson’s idea of nations as “imagined communities” connected through shared, immediate discourse (primarily newspapers), and Michael Warner’s notion of the “counterpublic,” which parallels — and often opposes — the bourgeois public sphere as described by Jürgen Habermas. Putnam’s primary argument is that British West Indians in the first half of the 20th century were part of a particular “imagined community,” formed by the increasing politicization of the African Diaspora then occurring all around the Black Atlantic. Britain’s failure to protect the rights and welfare of West Indians working abroad served as a catalyst for anti-colonial sentiment, ultimately helping spur demand for independence of their home islands from British rule. The West Indian immigrants to Costa Rica, Cuba, Panama, Venezuela, and Trinidad functioned as “counterpublics,” opposed to labor exploitation and racial discrimination. Music is important to Radical Moves, as it is to Gilroy and other scholars of the Black Atlantic. But Putnam’s book reassembles a more diverse group of counterpublics than just those to be found in the proto-dancehalls of United Fruit plantations. Each chapter is dedicated to a particular facet of immigrant life within the circum-Caribbean during the interwar period, covering problems of citizenship, new forms of religious expression, the eugenics and other racial “science” used to exclude certain immigrants, the local/global nature of the black press in the region, and the politics of deportation and the effect returnees had on their home islands. The British government initially acknowledged shared citizenship in the Empire between West Indians and Londoners. Colonial Office bureaucrats were happy to invoke the metaphor of Civis Romanus, especially when Trinidadian laborers helped solidify claims on territory disputed between British Guiana and Venezuela. But the lives of the West Indian migrants themselves were fundamentally unstable, with families often split apart by hundreds of miles of water, all-too-frequent unemployment, and inadequate childcare. In response to this instability, many new religions sprang up across the Caribbean, including Rastafarianism — the most famous — as well as other syncretic forms of religious expression, like the Spiritual Baptist theology expounded by T.U.B. Butler. These emergent beliefs had sources from a geographically large network of trade and association; a group like the Spiritual Baptists began with practices derived from pro-British, ex-slave exiles from the War of 1812, who brought with them ideas from the Second Great Awakening and the kind of occultism then in vogue in the United States. Elements of Santeria were added in some places, picked up by laborers working in Cuba; beliefs were widespread regarding sorcery and the deaths of children. With such rampant heterodoxy, it becomes difficult to say, definitively, just what any individual Spiritual Baptist might actually believe. The fact that many of the lawmakers enacting these measures would not themselves have been considered white by the northern eugenicists whose rhetoric they adopted did not go unremarked. Major employers like United Fruit were typically able to skirt these restrictions, as employers have regularly managed in the US; from this perspective, the policies look more hemispheric than a uniquely American abomination. Putnam notes that, in places like Venezuela and the Dominican Republic, “States were staking their claim to border control. If they could not achieve it through the smooth hegemony of documentary demands, they would do it by the blade of a machete.” Or not — however industry demanded. Putnam also delves into the ways in which black West Indians sought to get in on the immigrant exclusion game themselves. Many of the immigrants to places like Jamaica were Asian, particularly Chinese, and politicians stoked the flames of populism by roasting the foreign scapegoat. As British Caribbean migrants spread outward, they linked local publishing with Atlantic- and empire-wide media circuits to create an internationally connected black press, newspapers densely woven into community life but looking out across the globe. A rift existed between those editors and the young “regge” dancers, a conflict between the “high” and the “low” culture of the imagined community. But it is through both these discourses that circum-Caribbean counterpublics were linked to the rest of the Black Atlantic. Newspapers in Port Limón, Costa Rica, and Panama frequently republished articles from newspapers like The Chicago Defender within days of their initial publication. (United Fruit’s fleet of boats was certainly useful in this regard.) Without this media network and its political concerns, it’s difficult to imagine how the crowning of Ras Tafari as Haile Selassie I could have been transmuted into religious beliefs among poor, rural Jamaicans. Putnam, too, makes a convincing argument that “jazz” and the “Jazz Age” was the result of more than just New Orleans, Chicago, and Harlem. In particular, she astutely observes that while few jazz musicians in Harlem were West Indians, the owners and managers of the venues they played frequently were — as was their audience, which constituted a significant portion of Harlem’s black population in the 1920s and 1930s. Through the same networks that brought occultism and black newspapers from the United States to the circum-Caribbean, traveling US jazz musicians had a significant impact on the development of later West Indian music, from Trinidadian calypso to Jamaican ska. Although Radical Moves only infrequently touches on West Indian immigration to New York, Putnam does mention the calypsonian Wilmoth Houdini, whose colleagues included the Duke of Iron and a son of Caribbean immigrants calling himself “The Charmer,” better known today as Louis Farrakhan. Houdini’s 1939 “He Had It Coming” was rearranged by Louis Jordan as “Stone Cold Dead in the Market,” sung by Ella Fitzgerald in 1946. This single initiated a run of five #1 R&B singles in a row for Jordan, a feat never since repeated. “Stone Cold Dead in the Market” and its fellows “Choo Choo Ch’Boogie” and “Ain’t Nobody Here But Us Chickens” are key moments in the transition from big band to rock ‘n’ roll, revealing a Caribbean ancestry within that most “American” of musics. The final chapter of Radical Moves, “The Politics of Return and the Fracture of Rule in the British Caribbean, 1930-1940,” covers the period in which West Indian laborers were forcibly deported from the various Spanish-speaking countries in which they had made their homes. For many, this created a kind of nightmare right out of The Death Ship, since they had no documentation proving that they had ties to any particular West Indian island, and therefore were barred from entering any of them. (Civis Romanus having degraded so far even within the British Empire, apparently, that right of return no longer applied if you were black and lacked papers.) Those that did make it back to the place of their — or their parents’ or grandparents’ — birth found themselves in the unenviable position of being booted from relatively lucrative occupations abroad to a place with fewer opportunities than when they or their parents had left in the first place. Some, like T.U.B. Butler, seized this opportunity to strike for better wages and working conditions. Others, like C.L.R. James, pushed for a Federation of the West Indies, perhaps seeing the writing on the wall for the British Empire and fearing the consequences of being an independent, small-island nation in the shadow of the United States. Of course, that’s exactly what ended up happening. Putnam’s special contribution to our understanding of these events, in contrast to Harvey Neptune’s Caliban and the Yankees: Trinidad and the United States Occupation, which tells an otherwise similar story, is to suggest that the truly radical path was the way of the Rastafarian and the Spiritual Baptist — the very people so disdained by political leaders of the time. Though Rastafarianism, at least, probably hit its political high water mark in the 1970s Jamaica of Michael Manley and Bob Marley, Putnam’s larger point is that it and movements like it are wellsprings from which political hopes are renewed, even as Federations dissolve and unions are compromised. Radical Moves: Caribbean Migrants and the Politics of Race in the Jazz Age is a major work, one that illuminates a region and shows the surprising commonalities between the experiences of those within the United States and its hemispheric neighbors in the years leading up to World War II. The traces of those commonalities resonate into the present day, like a “regge” dance in Port Limón, for those who learn to listen.